What you need to know to create a beautiful bedroom without breaking the bank. If it has been years since you updated your bedroom’s décor, don’t despair if your budget is not as extensive as your dreams. Though glossy decorating magazines and websites are full of room makeovers that cost a fortune, you can actually go far in redecorating your bedroom (or any other room in the house, for that matter) without breaking the bank. The secret is in being willing to look for bargains, shopping in places you might not normally consider, and doing some of the work yourself. One of the easiest, least expensive ways to give an immediate, huge boost to the appearance of your bedroom is with paint. Painting is a fairly easy DIY project, and you can prep and paint a room over a weekend. You can buy a gallon of quality paint from any home improvement center for less than $60. When picking your color, only use the paint chips to narrow down your choices. Take the chips home, and tape them up on each wall in your bedroom. Look at the colors at different times of day, and in different lighting conditions. You’ll be surprised at how different even a basic white can look as light levels change throughout the day. 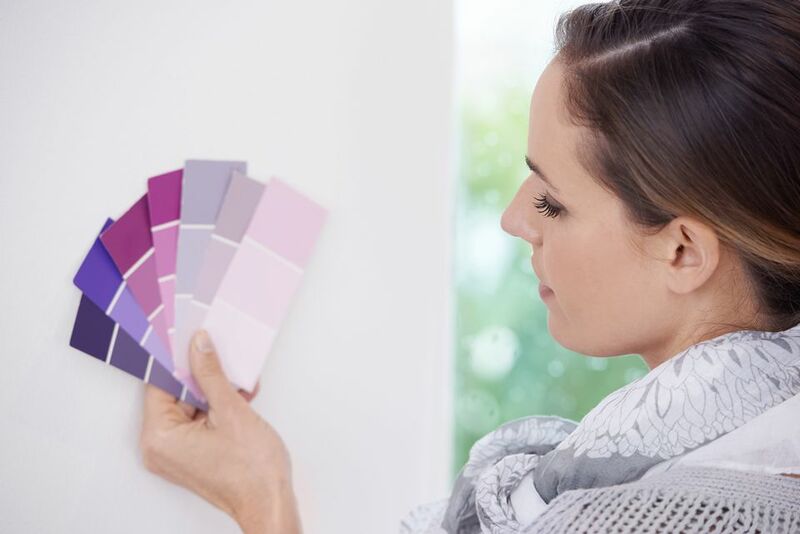 Once you have whittled your choices down to two or three colors, it is worth it to buy a sample-size can of each, and paint a large section of wall in each color under consideration. This will really show you how the color will look in bright morning sun, afternoon shadow, and nighttime lamplight. Once you have decided on your paint, purchase enough to cover your entire project. And though it might be tempting to buy the cheapest paintbrushes and rollers, this is not the place to skimp on costs. You don’t need to buy professional products, but go for at least the medium-level of quality. Good paintbrushes and rollers make a huge difference in the final appearance of your paint job. If your bedroom has old, stained or torn carpet; heavily damaged wood; or laminate covered with scuffs and scratches, it’s time to replace the flooring. Probably the least expensive option if your home is built on a concrete slab is to remove existing flooring and paint and seal the underlying concrete. It’s not a difficult DIY project, and you can achieve remarkable results with various faux painting techniques. This is definitely not a look for everyone, however, and because concrete is cold and hard, you will definitely want to top it with an area rug that extends to every side of the bed. If concrete flooring isn’t for you, vinyl or linoleum is the next inexpensive choice. While not as common in the bedroom as in bathrooms or kitchens, vinyl flooring comes in a huge range of colors and patterns, and is far warmer and softer to the touch than concrete. Plus, with all of the peel-and-stick options available, this is another project you can handle on your own. A third choice for a DIYer is wood laminate. Most of today’s laminate flooring clicks together easily, making the laying of new flooring almost as easy as assembling a jigsaw puzzle. Laminate comes in a wide range of designs, but can be expensive, so it pays to shop around. If your heart is set on carpet or wood (these are, after all, the most popular choices for bedroom flooring), you will need to shop for low prices, and someone to install them. Check your local flooring stores and home improvement centers for sales, clearance materials, or special discounts. If you live near a Habitat for Humanity ReSale store, you can find tremendous deals on surplus, used, or donated flooring materials, but you never know what will be in stock, and you must be prepared to buy right away if you find something you like. Look through your local PennySaver flyer, on Craigslist, or on home renovation recommendation websites for flooring installers who offer low prices. Check references, and be sure any contractor you use is licensed. Never pay the full cost of the job upfront; establish a payment schedule before the job begins. If buying used furniture, always inspect carefully for evidence of damage, excessive wear, or bedbugs before bringing the items into your home. Never buy a used mattress or bedding. Remember that your bedroom furniture doesn’t have to be a matched set; in fact, it often looks better to have furniture that is complementary, not matching. Your decorating accents show off your style and personality, so take care in choosing them. Only buy things you love, and that work well with your existing style. Rather than buying an entire roomful of artwork or other accessories at one time, spread your purchases out, and take your time in searching for things you love. In a bedroom, you’ll generally use lamps, window treatments, artwork, ceiling lighting, and bedding as your primary accents. Don’t resign yourself to sleeping in an out-of-date, bare, or just plain unattractive bedroom. You don’t have to spend a fortune to redecorate, and even small touches go a long way. Look for bargains, repurpose items you already own, and tackle projects you can do yourself. The results will surprise you, as you discover a beautifully decorated room can be yours at a discount.